Today's recipe is deep fried cookies. There are different types of deep fried cookies, pastry doughs and sandwich cookies.The inspiration for this one is Fried Chinese ginger cookies.I love them because they have a sweet crispy outside and you can try different flavors.This cookie has the enticing ginger and pineapple flavor. 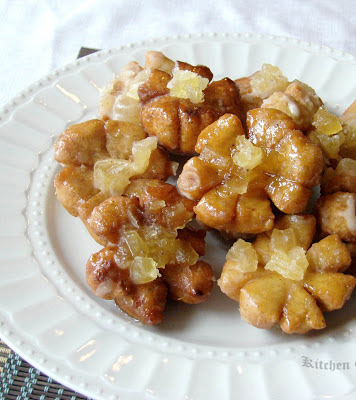 The cookie dough is fried and then glazed with a ginger- pineapple sugar syrup. You can also use honey instead of sugar for the syrup.Fry and served warm with the glaze and it is a delicious treat. Mix flour, ginger powder, cinnamon powder salt, sugar and baking powder. Make a well in the center. Add beaten egg and ginger juice and mix.Sprinkle little by little of water and knead into a dough. Do not over knead,but it should be a smooth dough that can be easily rolled. Allow this to rest for about half an hour. Lightly flour your working board and take small balls of the dough. Using a rolling pin flatten it and cut into desired shapes using a cookie cutter. Heat oil in a pan in medium flame. Gently slide the shaped dough into the oil. It will slowly rise to the surface of the oil and will puff up. Fry on both sides till it becomes golden brown and drain into paper towel. Continue to fry in batches. To make the syrup mix in pineapple,sugar, ginger juice,cinnamon and water. Mix and allow the sugar to dissolve. Reduce the flame to medium and allow the sugar syrup to thicken and reach one thread consistency. Switch off the flame and when it cools down a bit drizzle it over the fried cookies. Enjoy! frying cookies is such an awesome idea.. loved it! Interesting recipe.. looks great !! Never tasted this cookies. Looks fantastic. Love it! This is a new recipe to me,Looks delicious with the glaze...Yummmy!! Cookies look so inviting and mouthful. Lovely preparation. Ithu kollamallo, ennikku try cheyanam. That's a good looking one.. Awesome and innovative. Nice flower. They look so pretty. Nice recipe Suja. Never tasted something like this. Looks too good Suja ! mmm...yummy and tempting glaze to try this one Suja..
Looks so tempting and yummy....very nice clicks. Very attractive fried cookies, seriously am in love with the syrup,excellent snacks. I have never seen cookies like that before! They are so cute and yummy looking. yummy cookies. new recipe to me :) wish to taste some..Loved the glaze..
very innovative recipe dear.. well made..
haven't heard of these cookies...sure look very very attractive! !